When the Abyss Records are saying that their new signing Hyperborean demos were well received, I am in agreement. After all I should know, as I am in possession of all three of them dating back to 2002 Of Malice. After a long break of six years since their last demo, Prey, the Swedes are back with their full-length release The Spirit of Warfare. Oh how the times have changed for Hyperborean. I still have the photograph with what seemed to be a bunch of young romantics which came with Of Malice. That lineup completely revamped, Hyperborean of 2011 has had a style overhaul as well. Forget the melodic death/black/thrash from Of Malice, gone are female vocal inserts in the style of old In Flames and Dark Tranquillity, there is no trace of any gothic inklings from Thorns Scar Her Soul, but the remainder of Hyperborean (what I surmise are vocalist Magnus Persson and guitarist Andreas Blomquist) remains to be interested in the subject first approached on their last 2005 demo Prey, i.e. military history, especially as it pertains to Europe and war upheavals of that continent in the distant and more recent past. Suitably then, the youthful exuberance and enthusiasm of Hyperborean earliest works is replaced with razor sharp, shrill, but extremely cleanly produced militaristic harshness, firmly on display in Viper and Channeling the Spirit of Warfare. War conflicts are a vicious subject and Hyperborean music lives the part. The clean tremolo cuts to the bone and drums blast when needed. The songs like Killing Grounds present an ominous, even if fleeting, feeling. At the same time, Hyperborean can inject mournful pain into their melodic tremolo (A New Sun Rises) or come up with their own personal touch by weaving in very prominent piano lines, absolutely unexpectedly, into the massive wall-of-sound guitar parts in Weapon Mankind and The Sick Man of Europe. Those piano moments are gripping cold fingers of fear permeating the souls of men who march to their death. If earlier Hyperborean looked to the aforementioned melodic death/thrash of In Flames and Dark Tranquillity for influence, nowadays the band is a more direct comparison to Necrophobic and Lord Belial. Hyperborean compositions, now significantly longer and going through a number of parts and tempos, can be towering in their blackened symphonic grandeur, just like The Last Stand of Leonidas and the Battle of Thermopylae does lashing out at the listener after a softer intro. 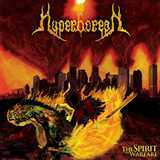 Acoustic tenderness and melodic solo in the middle of that composition only accentuate the symphonic approach to harsh extreme music subscribed to now by Hyperborean. The criticism could be that this style of cleaner, well produced melodic black/death metal with symphonic touches has long come and gone through its peak, and Hyperborean are trying to catch the train which is now long departed. I would point out that the band’s vision of their lyrical subject, the Erich Maria Remarque of sorts, is very suitable to the style of music they play, but in my opinion the melodic suit fits Hyperborean so well, they don’t have to discard it all in favor of martial bleakness and austerity.